Kolar, April 13: Campaigning for the party candidates in fray in the Lok Sabha elections in Karnataka, Congress President Rahul Gandhi on Saturday promised to create jobs for lakhs of youth, income for the poor and loan waiver for farmers, if elected to power. 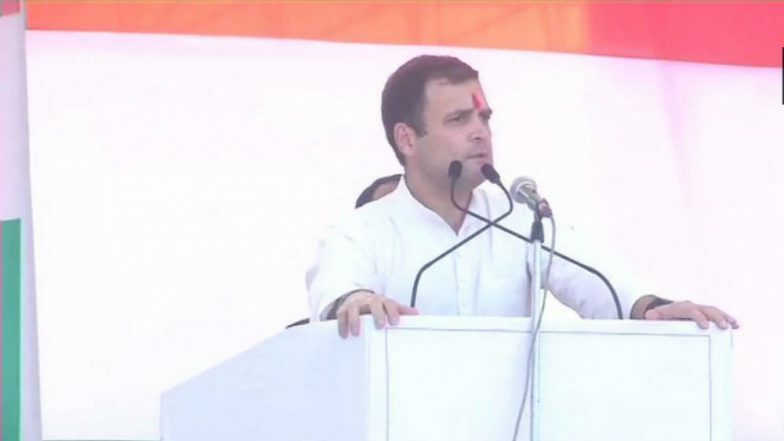 "When we come back to power, we will create jobs for youth, fill up all the 22 lakh vacancies in the Central government and 10 lakh jobs at panchayat level, give Rs 6,000 per month to 5 crore poor families and waive loans to farmers," said Gandhi in Hindi at a poll rally here, about 100 km east of Bengaluru. Threat to Rahul Gandhi's Life, Laser From Sniper Gun Aimed at Him in Amethi, Congress Tells MHA. His 30-minute speech in Hindi was simultaneously translated into Kannada by party's senior leader B.L. Shankar. Attacking Prime Minister Narendra Modi for making allegedly false promises, failing to create jobs, not waiving farm loans and robbing small businesses and traders with note ban and faulty Goods and Services Tax (GST) regime, Gandhi said if elected to power, the party would have special schemes and programmes for equitable growth and social justice to all the people across the country. "Under our flagship programme Nyay, as promised in our manifesto, we will credit into every poor woman's account Rs 6,000 per month or Rs 72,000 per year, covering 25 crore people or 5 crore poor families across the country," asserted Gandhi. Assuring the women of securing 33 per cent reservation for them in Parliament and assemblies across the country, Gandhi said the party would also reserve 33 per cent of jobs in the Central government to women, and funds for self-help groups run mostly launched and run by them. "For thousands of small businesses, traders and others, Modi's note ban had disrupted not only their businesses but also suffered huge losses since then imposition of demonetisation on November 8, 2016," said Gandhi. Claiming that the grand old party worked for all sections of people, Gandhi said the GST regime would be simplified and modified to make it transparent and easier to pay with a single rate. "For the benefit of farmers across the country, our party will have a separate or special budget for farmers along with the general budget with measures to make farming rewarding and profitable" said Gandhi. Lamenting that Modi worked and benefited only the rich like Anil Ambani, Gautam Adani, Nirav Modi, Lalit Modi, Mehul Choksi and Vijay Mallya, the party would work for the youth, women and the poor. "Entrepreneurs creating jobs for others will be given 3-year tax exemption and right to set up their start-ups without any permission or clearances. They will be given bank loans to make in India," added Gandhi.